Reliance free roaming plans Activation for 1 day and monthly. Reliance being a second largest telecom company after Airtel, offers various special STV(Special tariff Voucher) which attracts their customers. Roaming free is one such offer, while other service provider too has decided to provide the same offer, after TRAI reduced the roaming tariff limitation. 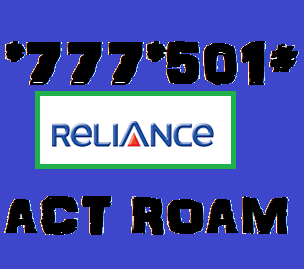 With One day roaming free at Rs 5, Reliance also provides monthly and 6 months roaming free offer. Here is the details for activation. The code is valid for all state of India. Once you dial the provided USSD or SMS, you will receive a confirmation message about the activation of the service. This offer will cost you Rs 5 from your main balance and it would be valid for only 1 day. You may also check reliance 4G jio services. For monthly and 6 monthly subscription, you need to recharge as STV(special tariff voucher) which might cost you around 77 Rs and 198 Rs respectively. Only incoming calls and Message would be free, while you are charged for outgoing calls and SMS according to call rates while roaming. Hope you are now successful to make a recharge of One day free roaming in Reliance with USSD code or Via SMS. Comment below if you have issues and other experience, to activate the roaming free plan. I have recharged my account with both STV 65 & 77 for activation of free roaming. But it isn’t working and i am still charged for roaming on every incoming call. How to recharge for monthly roaming through sms? Sir I want to delete my roaming plan held in my sim and starts previous normal plan without roaming.